No Probs MK, like you said let wait and see. Keep up your good work! The Gateway Hotel celebrates the inauguration of the Olympic Games with a formal cake cutting ceremony. A cake shaped like an English hat, a spirited chief guest and an enthusiastic crowd formed part of the Gateway Hotel’s celebration to mark the inauguration of the Olympic Games. The cake featured Olympic rings and the names of top sportspersons. The hill-top hotel will screen the event for its guests. Inaugurating the function, sprinter R. Pandeeswari expressed how her long-time desire to visit the hotel was fulfilled at last. “Life has come full circle for me,” she says. “I used to visit the adjacent hill for high-altitude training but never really got an opportunity to enter this hotel. But my dream has come true today,” she says. Cashing in on the Olympics fever, the hotel has churned out innovative recipes for ‘active food’. Breaking the perception that healthy food does not taste good, the Gateway Hotel has introduced food that has a low glycaemic index and is high on antioxidants and rich in fibre. Conceptualised by corporate chef Natarajan, the active food menu includes whole wheat walnut muffin, blueberry smoothie, and omelette without yolk and with broccoli and tofu. The hotel also offers the signature multigrain Gateway Dosa, a natural pro-biotic preparation enhanced with nine different grains and legumes. The gourmet dishes incorporate barley, oats, mixed grains and unpolished rice. Steamed or grilled fish high in omega 3 fatty acids, multigrain bread and lettuce salad add sheen to the menu, with high-fibre cereal and yoghurt bars, unique tomato soup with herbs, and super foods like beets, legumes, tomatoes and apples. Saw Hotel Temple City's "Dreamz Inn" in 120 feet road. Exterior works are almost finished. Is it opened already or ready for inauguration?? Aaru suvai-Free Home Delivery Meals...!!!!!! Are you got boring of having same meal...on the restaurants and hotels...? are you running out of the time to prepare the food? are you interested to have healthy and home made food every day? Are you interested to have a different variety of veg meals....?? Aarusuvai......we are going to opening aarusuvai & Madurai Biryani unit ....to provide a fresh, healthy and home made food at the cost of free home delivery in Madurai...shortly....!!!! Flavours from Hyderabad - Now in our Madurai !! - BUFFET Lunch at Hotel Fortune Pandiyan from today !! Hotel Fortune Pandiyan brings an enticing platter from the city of nawabs !! The unique flavour of spicy biryanis and kebabs and other exotic aromas would meander through the kitchen and dining of the Fortune Pandiyan Hotel from today (Friday). Using traditional spices like potli masala, poppy seeds, betel and Kashmiri chilli, the Hyderabadi fest will kickstart the culinary journey with ‘shikampuri aloo tikkis’ –spicy potato cutlets with finely chopped and pounded vegetables. A perfect starter, it goes well with tricolour chutneys –chilli, mint and garlic. ‘Tandoori pomfret’ and ‘dakshin murgh’ – these kebabs are marinated with hung curd and potli masala. This muslin potli has aromatic herbs and spices. “The hung curd not only binds the kebabs, but also minimises the use of lime juice as marinade.” says Executive Chef Bala Subramanian. The combined flavours of curd and masala put the proverbial ‘chaar chand’ into these starters. The main course will have the tasty and spicy Hyderabadi biryanis. The Farsi flatbread beams of ghee and saffron that has mild sweet and salty tastes gels wells with both vegetarian and non-vegetarian dishes. ‘Bagara Baingan’ and spinach made with cream is a perfect combo with the typical Hyderabadi haleem – a salty porridge of broken wheat and mutton. A strong flavour of mutton, derived after slow tempering, is spiked with a sprinkling of lime juice. The dessert section is all set to have Hyderabad’s traditional sweet dishes like Kubani Ka meetha, Kaalaa jaamun, Firni and Gulkund. And of course, kulfis – strawberry, pistachio and saffron are part of the menu. Chef Bala Subramanian says that the hotel has planned to display different varieties of food items unique to Hyderabad in the 10-day food festival. “We will not repeat the menu during the festival,” he assures. The perfect blending and mixing of ingredients will make the plethora of wide ranging dishes hard to resist. The food fest is on at the Orchid Restaurant, Fortune Pandiyan Hotel, from September 7 to 16. On weekends, buffet is available for lunch and dinner and on weekdays, only the dinner. The buffet is charged at Rs.550 for adults and Rs.300 for children. For reservation enquiries contact 9952424420 and 9791410101. Café Coffee Day (CCD)has started its “Coffee Festival” in the city and will go on till November 15. In an endeavour to share the art of coffee making with its consumers, CCD has organised the ‘Coffee Festival’ at two of its cafes in Madurai namely – the HIG 24 café at Anna Nagar and the Madurai KB Towers café at New Natham road. The festival was kick-started by Coffee Evangelist Sam Rozario at Café Coffee Day at Anna Nagar. He showcased the fine art of coffee making while sharing the many interesting facets of coffee. 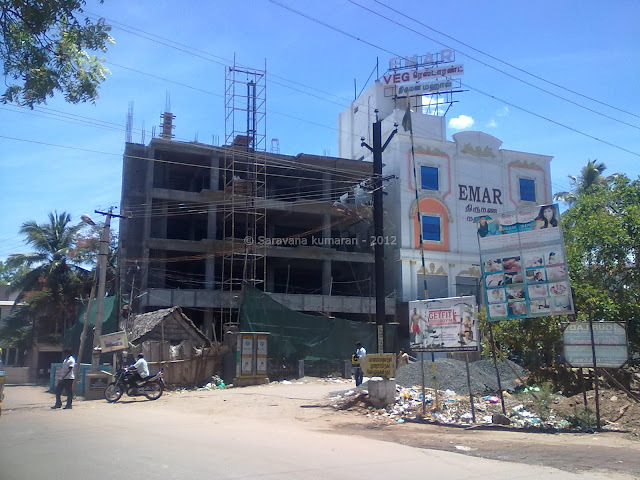 MK what happens if we post the list of Star Hotels in Madurai ! Should we post it now or after we get the list completed? In one's life, one visits a lot of places, but one's own sensibilities and conditioning clouds the perception that one forms about the place in question. I feel, one can never truly experience a place unless it's through the eyes, ears, and palate of a local. At Madurai, after getting in early that morning and after visiting the Meenakshi Amman Temple, we did exactly that. We had got a reference from TripAdvisor.in about an initiative called Foodies Day Out, which takes visitors around the city of Madurai on a culinary journey. Being a foodie, that was hard for me to resist and I thanked my stars when Neeti agreed enthusiastically to join in. We met Pandian at the eastern Gopuram of the Temple. Pandian, a technopreneur, who has a great passion for the local cuisine of Madurai, the street food kind of stuff that the grew up eating which a tourist would rarely get to taste. Pandian walked through the markets alongside the Temple and that was when we tasted something very unique and refreshing. It came as a revelation to me that the kernel of the coconut palm stem is consumed. We came across a roadside cart, with ivory sprigs of coconut tree blossoms placed strategically to draw attention. On the cart, there lay fresh green logs, logs of coconut palm. Pandian suggested that we try the thennang kuruthu. The vendor peeled away the trunk to reveal the ivory white kernel, which was then sliced to wafer thin bite sizes, handed over to us on a newspaper. The next step was to dig-in - the thennang kuruthu had a mild sweetness with a unique delicate flavour. We were told that is a preferred snack to much on, on the streets of Madurai - low on calories and high on water, the high mineral and roughage content made thennang kuruthu an ideal snack of sorts! We next proceeded to a tiny little shop opposite the Mission Hospital. This shop managed by a fiesty middle-aged lady was a popular for a delicate South Indian preparation, the idiappam (string hoppers). I was not new to the idiappam - I recall having it long back in the early 1980s as a kid in Zambia at a Sri Lankan family's place, but this was Neeti's tryst with the idiappam. And voila, the lady handed us two plates of idiappams - one with a tangy red tomato-coconut gravy and the other with mildly sweetened coconut milk. The idiappams were just just out of the steamer and went very well alongwith the gravy and the sweetened coconut milk. Pandian did mention that idiappams were usually served as a breakfast meal in Madurai - yes, it is an ideal breakfast meal with minimal fat. In fact this outlet is frequented by patients of the hospital across the road - now that is indeed testimony that food in small joints like this is truly healthy simply because, as I explained in the previous post, the turnover is so high that it is virtually impossible for anything to go stale! Our next point of call was the Vandiyoor Teppakulam, or the temple tank. Despite having passed by the city a number of times, this was the first time I saw this 1000 feet by 950 feet waterbody. Vandiyoor Teppakulam, which was constructed in 1645, and is fed by the the River Vaigai through a series of underground channels. In the middle of the tank is an island called Mayya Mandapam, which has a temple and quite a few lush green trees. Obviously this place is popular recreational spot for the locals, who come here to enjoy the breezy sunset, much like Bandstand or the Marine Drive in Mumbai. In fact I was surprised to know that in Tamil Nadu, Madurai is also called Thoonga Nagaram i.e. a city that never sleeps. So far, this description fitted the megapolis of Mumbai well. But Madurai? Well it did seem to be true after all, seeing all the people having a good time around the temple tank munching on their favourite snack and savoring their gossips. And where there are people, there has to be food! Pandian took us to a handcart manned by a Tamil couple making idiappams and ragi puttu - steamed ragi (millet) with coconut and sugar. As we stood there waiting for our puttu to get ready, a young boy stood there looking wide-eyed expectantly for his snack to get ready. For a moment that reminded me of my days as a little boy, when I too was like that standing in the kitchen waiting for Mom to retrieve the goodies from the oven. Millet was stuffed into a cylindrical mould and steamed to make the puttu. After about 5 minutes, the vendor manning the cart took out the mould, extracted the millet, which had now taken a cylindrical shape. He then crushed the millet cake into coarse crumbs and sprinkled sugar and coconut over it. The puttu tasted coarse and rustic, but did exude a certain earthy goodness. After taking a few bites, Pandian returned with something that looked like a pakora (fritter) - made from the kind of chillies used to make the Hyderabadi mirchi ka salan. After tasting the subtle idiappams with delicately sweet coconut milk and the puttu, the sweetness of sugar itself was a bit too much and so the chilli pakora bought instant relief with its spiciness. The next stop on the foodies tour was my personal favourite. Pandian took us to an unassuming roadside eatery opposite PAMC Hospital. We were told that this outlet started as a handcart. The food became so popular that the joint expanded significantly. Pandian, it appears, loved the food so much that this guy provided some catering for his wedding reception! This place was popular for a personal favourite, something that I had eaten a couple of years back while travelling from Thirunelveli back to Madurai, late at night. Ever since that day, I used to salivate over the thought of the Kothu Parotta. Today was a golden opportunity to devour this sinful delight. The beginnings of this sinful delight usually begins with making a flaky parotta with white flour dough. But at this place, the dough was rolled out into a thin sheet, in a way one makes a roomali roti, and in what is typical to Madurai, instead of being cooked on a greased griddle, the thinned out dough was rolled into bun-kind of a shape with generous drops - fat drops of oil sprinkled on it and then the whole thing was cooked on the griddle. After the flaky parotta got ready, it was time to make the kothu parotta - on to griddle go the big fat drops of oil, followed by onions. As the onions go translucent, in go green chillies, tomatoes and curry leaves. And then after that beaten eggs go in. Instead of letting the beaten eggs settle, the concoction was mixed up without letting the eggs get cooked. In the runny mixture, the cook put in crushed parotta. Then the cook skillfully pulled out his tools - two steel sheets were used to beat the parotta-egg-vegetable mixture into tiny homogenised pieces with noisy clangs. I am told the clangs build up the excitement of having the kothu parotta! That is not all - generous spoons of a coconut-mutton gravy called chalna were mixed into the concoction! We then had this amazing kothu parotta, steaming hot, with a chicken gravy! Neeti, who was having this heavenly combo for the first time, gasped at the amounts of oil that went into it, but then sinful is also enjoyable sometimes! I guess why we call this kind of food heavenly is because the cholesterol certainly puts one closer to heaven(?)! Our next pit stop was another joint which was a bit more organised than the previous joints we had visited - this was in a building! As we moved in, we were ushered into rooms full of families enjoying a relaxed meal. Pandian ordered curry dosa and half-boiled dosa for us. Curry dosa was an amazingly spicy mutton based preparation made on dosa batter, while the half-boiled dosa was incredibly simple - an egg broken over a plain dosa sprinkled with highly aromatic freshly ground pepper. We had both these dosas with a spicy coconut gravy, with an egg beaten in. By now we really had a quite a lot, with little spare capacity! At our behest, Pandian skipped vegetarian cuisine, the kind we had at Murugan's earlier in the day and we headed straight to the areas around the Meenakshi Amman Temple for a local speciality - a juice made of cotton seeds, flour of raw rice, coconut and jaggery, called Paruthi Pal! That wasn't something I had heard of before. We were told that Paruthi Pal was a health drink! But sadly, the vendor wasn't on work that day. Perhaps, that was Madurai's way of telling Neeti and me, "Please visit us again to try out Paruthi Pal!" But we moved on try out something equally interesting. Pandian found something interesting with a streetside vendor on a busy street near the Temple. The vendor had some bright yellow fruit. Pandian called us with a lot of enthusiasm. As we went closer, I was surprised to see the vendor was chopping jackfruit, a version of the South East Asian durian, I had always known jackfruit as Kathal, something that my grandmother would cut with oiled hands (jackfruit is too sticky and itchy) using her traditional cutting appliance called dratti! Then the Kathal would be fried and cooked into a spicy gravy. On a trip to Coorg last year, we figured out that jackfruit trees grows abundantly in coffee plantations alongwith spice shrubs. When jackfruit ripen on trees, they give out an aroma that attracts elephants. And then when the fruit ferments, it ends up intoxicating the elephants who then run riot through the plantations, devastating coffee and spice produce. But Madurai gave us a totally different perspective on jackfruit. 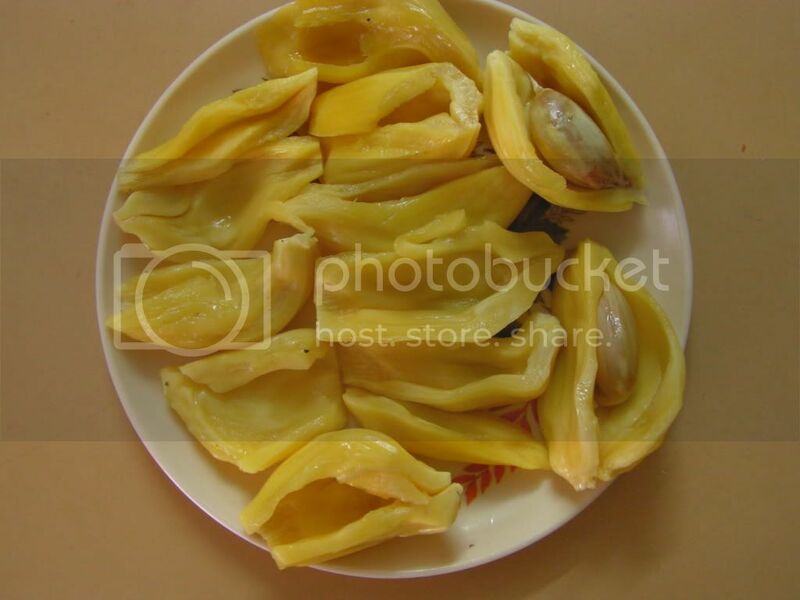 The vendor skillfully cut up the jackfruit, peeled away at the fibre to reveal a bright yellow fleshy tissue which was handed over to us on a piece of paper. With some trepidation we tried the fruit - it was aromatic (much like a sweet perfume) and it tasted like nothing I had before, it was as sweet as nectar. This was a true revelation! We walked down the busy streets of Madurai. Families were out shopping enthusiastically - clothes, toys, vegetables, spices and what not! The spicy aromas wafting out of spice wholesale shops, reminded me that we were not too far from the spice country! We stopped at a shop where Pandian showed us the sun-dried sundakka that had gone into the Vathal Kozhambu that I had enjoyed at Coimbatore a few days back! It was then time to devour some dessert. Pandian got us some adirasam - a doughnut shaped delicacy made with palm sugar and poli, something like the Maharashtrian puranpoli but made with palm sugar. And then Pandian insisted we cool off with jigger thanda, the refreshingly cold dessert we had earlier in the day at Murugan's! After we could take no more, we pleaded with Pandian to end the foodies trip, though he much more to offer! Our wish was granted, with Pandian driving us back to the hotel. The foodies day out with Pandian was a revelation for us both. Neeti and I never knew Madurai had so much, so much to offer. Every city does, only if we choose to experience each place through the eyes of the local. I wish Pandian all the very best for his noble initiative, Foodies Day Out. For me, this unique tour of Madurai would forever be etched in my memory! Rani Mangammal Chathram, a 17th century building, one of the few remaining edifices of the bygone royal era, that remained closed for the past five years, has been given a facelift and opened for public on Thursday. "The chathram has been renovated at a cost of Rs 90 lakh. The chathram was left abandoned and it was in bad shape despite the historic significance. We have renovated the chathram to uphold the name of the great queen Rani Mangammal," said mayor V V Rajan Chellappa, who inaugurated the refurbished building in the presence of corporation commissioner R Nanthagopal. The refurbished chathram would have 24 rooms in the two floors out of which, 18 rooms are airconditioned. Though there are yatri nivas' and hotels in the vicinity of Meenakshi temple, corporation officials said the tariff at the chathram would be relatively lesser. The chathram (choultry) was built by Queen Rani Mangammal for devotees visiting the Meenakshi temple and other royal visitors during her reign in Madurai between 1689 and 1704, opposite the present day railway junction. The choultry was among several such public welfare initiatives by Mangammal and was of great help to devotees visiting the temple, which was situated one km away. While the first floor of the chathram had rooms to accommodate the pilgrims, the ground floor had a stable to house their horses. Even after Mangammal's death, the chathram used to function as ever. But few years back, the chathram turned out to be a den of anti-social elements. Five years back, there was clash between two groups of men staying in the chathram, when reality struck the corporation officials. The officials realised the need to bring order in the chathram as well as renovate the damaged portions. So it was closed and subsequently the renovation work began. "Henceforth, there would not be any room for misuse of the building. The chathram would be maintained in a proper manner," Chellappa said. Besides, giving a impressive front elevation, replacement of damaged portions, tiles were laid and the building was given a fresh coat of paint. Four deluxe rooms have also been added to it. In addition to providing accommodation, the chathram would also help tourists as an information centre has been established there. The centre that was inaugurated in December last year has colourful photographs along with the details of places of worship in the temple city. Novotel Hotels chain in Madurai ? Can someone clarify this? Looks like very huge project. Are they really coming or clerical mistake?